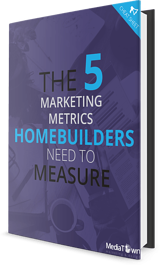 The 5 Marketing Metrics HomeBuilders Need To Measure. As a custom Home Builder, your organization works tirelessly to move the needle on an endless amount of metrics & reports. All these metrics mean it's easy for marketers to get lost in the data. This is especially true when it comes to analyzing the impact of your marketing efforts as a whole. If (like most of us) you're wondering which metrics are essential for tracking the effectiveness of a marketing campaign, this FREE ebook is for you. 5 marketing metrics that will help you measure the value of your marketing efforts. Formulas and examples to help you calculate your own metrics. Explanations and scenarios of why these metrics are important and how to interpret them. Download this cheat sheet to showcase the true value of your marketing efforts. Download The 5 Metrics eBook Now!